Type: Lithium Ion. Voltage: 3.6 V. Capacity: 800 mAh. Height: 53.8 mm. Width: 35.4 mm. Depth: 5.7 mm. Replaces: Motorola BT50, BT60, BA685 and BE1000MOT Battery. Suitable for: Motorola C975, E1000, V1050, V980 and more. This Motorola Mobile Phone BT60 Li-Ion cell phone battery fits several Motorola mobile telephones like the Motorola C975 and E1000 phones. Suitable for: Motorola C975, E1000, V1050, V980 and more. It is a DIRECT replacement for the Motorola BT50, BT60, BA685, BQ50, BT-50, CFNN1037, SNN5766A, SNN5771, SNN5771A, SNN5804A and BE1000MOT batteries. 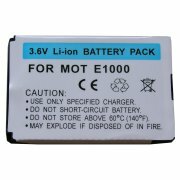 This Motorola BT60 mobile phone battery is NOT compatible with more recent 'phones such as the Motorola MB511 Flipout. This Motorola Mobile Phone BT60 Li-Ion cell-phone battery is rated at 800 mAh, a greater capacity than most replacement batteries available. Use our Motorola Mobile Phone BT60 battery to get a longer standby time and longer talk time for your Motorola Mobile Phone . Give this Motorola Mobile Phone BT60 battery a long initial charge before use, 18 hours and more, to ensure top performance.